10 Video Game Series with the Best Music (2019) | Nerd Much? Music is an undeniable part of our lives. Whether we use it to jam out to on the way to work or school or play it ourselves, there’s always a time and place for music. Not only does the power of song help us get through our day to day lives, but it’s also important to have, especially in movies, cartoons, and video games, where the viewer (or player) must both see and hear to experience. Video games often play like interactive movies and stories, with music and soundtracks that add to the scenery and setting of a game. In video games, there’s always that one song that keeps us going, whether it’s during a cutscene or blaring over the speakers during a final boss fight. Some games have exceptional soundtracks, ranging from instrumental pieces to full-on voiced songs. 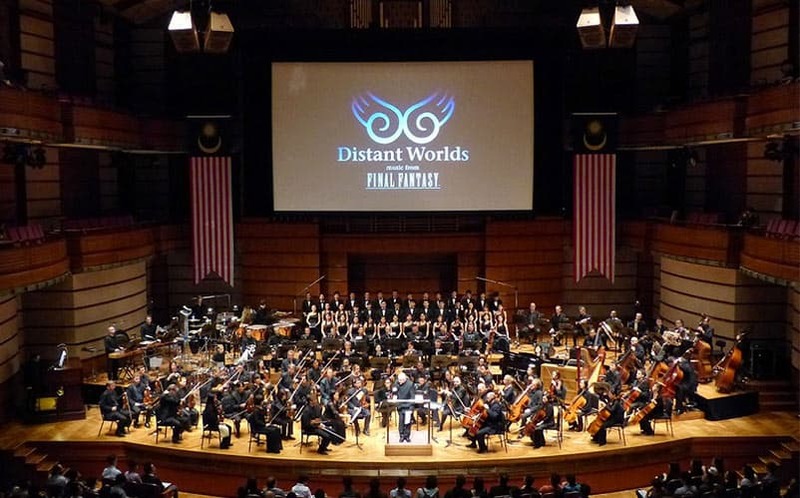 Video game music is a genre of its own, with either specially composed songs or the use of new, original pieces to add to the overall feel of the game. Below is a list of video game franchises with exceptional soundtracks. (Note: This list doesn’t contain any rhythm or dancing games). The Persona series not only is known for its innovative gameplay and battle system, it also has some of the most influential and unique soundtracks in the video game world. Created by composer Shoji Meguro, each Persona game has its own unique style of song that forms its own genre of music. At first, Persona music seems really odd, but after a few listens it becomes one of the best sounds in the world. Meguro nearly formed his own genre of song that is a combination of pop, rock, disco, jazz, and more. The vocals for each Persona song are almost always sung in English, each song with a deeper meaning that relates to the game. Recently, Persona 4 Dancing All Night came out, a rhythm game remixing popular Persona 4 songs. Although P4 has a distinctive pop style, the release of Persona 5 will be a completely new style based on the “acid jazz” genre. Persona music is definitely unique and memorable, especially after the many hours invested into the game. Combine beautiful instrumental tracks, intense guitar jams, and lovely vocals to make up the experience that is Xenoblade Chronicles, one of the best RPGs ever made. Xenoblade‘s soundtrack is very different than typical RPG tracks, with specific songs for every area of the game. Xenoblade is an extremely long game with many areas and places to explore, so music is essential to pull the players into the fictional world of Bionis. Each song fits each area very well, from the warm, slow song in the cute Nopon village to the robot like music at Mechon (robot) factory. One of the best tracks can be heard in Gaur Plains, and it’s a song so simple, yet catchy enough to run for the many minutes that you’ll be walking around the expansive map. Be prepared for songs that will cause you to cry at the emotional parts of the game, especially during the various cutscenes and multiple plot twists in the narrative. Final Fantasy has been around for quite some time, being one of the most influential and prominent RPGs in today’s gaming world. One of the most notable things about Final Fantasy is its soundtracks, which are beautifully orchestrated songs varying between instrumental and vocal styles. FF’s songs are absolutely gorgeous, especially the various piano arrangements present in many of the games. When looking at the legacy of this series, it’s important to note that from its very beginnings, FF’s music was ahead of its time. And, the series has released some of the best video game soundtracks of all-time. There’s no doubt that the music of Final Fantasy was an influence for future RPGs, and will continue to be important until this day. Objection! It’s hard to believe that a game series about lawyers would have some of the best video game music around. But, that’s part of the reason we believe that the Ace Attorney series is so epic, standing out as one of the most unique point and click adventures of all time. When cross-examining witnesses and choosing between evidence to present in court, the upbeat songs motivate players and add to the tension of the situation. One of the most beloved songs is “Cornered,” which plays at the height of the cross-examination and rebuttal. Ace Attorney is definitely a weird and amazing series that depicts a courtroom unlike any we could have imagined. The newest AA game has some of the best orchestrated themes across the series, and future titles will also follow up with great tunes to point your finger and shout “Objection!” to. What’s better than exploring a post-apocalyptic America while blasting classic 1950’s tunes on your personal radio? Putting older music into a modern game seems like it wouldn’t work at first, but this is certainly not the case in Fallout. The setting of the harsh and divided worlds in each Fallout game is complimented with cheerful American tunes such as “Anything Goes ” by Cole Porter and “Jingle Jangle Jingle” by Kay Kyser. The symbolism within the songs is very interesting to look at, especially the contrast between the cheerful “American dream” themes and what the states have become due to a nuclear war. Every Fallout game features this type of music, and it confirmed that Fallout 4 will have even more tunes to take out Raiders and Deathclaws to. With this, the game exposes players to a genre that they may have not been too familiar with. If you decide that you’ve heard enough of songs like “Johnny Guitar,” the actual instrumental soundtrack from the games are amazing as well, giving off a creepy and eerie vibe which the game accomplishes so well. Nintendo games, as well as the company itself, is known for its unforgettable soundtracks in its games. The Legend of Zelda, being one of the most popular series, has some of the most memorable songs — all of which contribute to the beauty of the games. Many of the Zelda tunes are very relaxing, something to contrast the heavy, serious songs many games tend to offer. Many of the songs in Zelda are very nostalgic, especially when looking at older games. Just listening to one or two songs from the Ocarina of Time, for example, can cause many memories to be brought back. It’s important to note that the Zelda orchestra travels around various parts of the world to perform, giving fans an opportunity to listen to the music in a concert setting. Like Zelda, Pokemon is a nostalgic series with top-notch soundtracks that hit close to home for longtime fans of the original series. Whether it’s the theme when you first obtain a Pokemon from Oak, or the Final Four battle at the end of the game, listening to Pokemon songs is always a pleasure. The newer Pokemon games also have amazing, updated music that only adds to the epic ventures of taming wild creatures while traveling from town to town with the ultimate goal of being the best Pokemon master/trainer in the area. Nothing will ever beat the feeling from when you run into the tall grass, the battle theme blasting throughout the speakers. When one thinks of Mario, the first thing that comes to mind is the classic jingle that still holds up nicely. Mario undeniably revolutionized video gaming, thanks to its style and gameplay. However, it’s important to note that Mario game soundtracks are one of a kind, mixing upbeat jingles and tunes to create a distinctive song that will always get stuck in one’s head. Each Mario game has had its own twist on a soundtrack for jumping through the various worlds and avoiding enemies. Many songs, like in The Legend of Zelda, are very relaxing. Some of the newer titles, such as Super Mario 3D World for the Wii U, have new songs that are amazing, feel-good tunes. Mario will always hold a special place in a gamer’s heart, and the music proves that. Hopefully, with the Nintendo NX around the corner, Mario will continue to push the musical envelope. Fire Emblem, as a series, has plenty of nostalgic tunes for longtime fans of the strategy RPG. However, something that stands FE apart from some of the other Nintendo titles is the epic battle tunes and chants that play into the war-like setting of the games. Fire Emblem stands out with its absolutely gorgeous soundtrack that reflects it’s setting perfectly. The newer title that is to be released stateside next year, Fire Emblem Fates, has one of the best soundtracks to date, with soothing vocals and well-orchestrated songs. The older games also have classic tracks that are worth listening to, on the battlefield and off. The most recent series on this list, Hotline Miami, is a very up and coming series that combines fast-paced gameplay with a violent twist and is critically acclaimed across many review websites. In this game, players can choose a mask which influences their abilities to carry out specific tasks given to them by phone. What’s important to mention is that the soundtrack for Hotline is simply amazing, combining 1980’s pop influence with remixed beats. Even if the gameplay is hard to get used to at first, the songs help you get through it. Hotline definitely has a soundtrack to remember. This list is only a small sample of the amazing video game soundtracks out there. Comment your favorite video game songs and soundtracks below— we’d love to hear from you!